New website: I am very excited to be able to formally share the news that our brand new website is now live; you should have received an email about it in the last couple of weeks when it was first launched. This is a real positive, not just for us but also because it provides a much better user experience for clients and job-seekers. With the site improvements, we expect our jobs to get out to a much wider audience and to generate a higher number of online registrations and CV uploads. This is great news for all of us! Have you had a look around the new site? 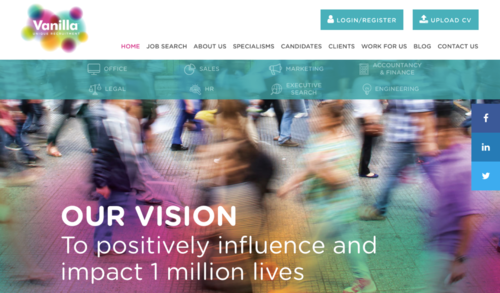 There’s loads more information for you as a client – find out more about our specialisms, our team, and read blogs about interview techniques, writing job descriptions, case studies etc. It’s worth a browse. If you have any feedback we’d love to hear from you. 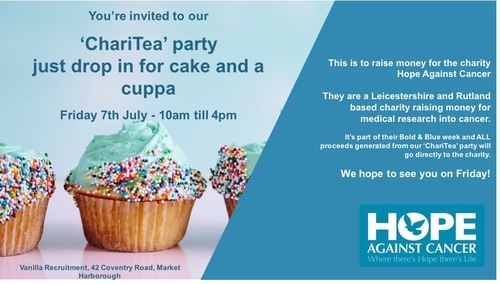 If you're in and around Market Harborough on Friday 7th July, we're hosting a 'ChariTea' Party to raise money for local charity Hope Against Cancer. They do great work with medical research into finding cures for cancer. Drop into our office anytime between 10am and 4pm and have a slice of cake and a cuppa with us and make any level of donation to the charity. We'd love to see you. So, when I wrote my blog for June, we were about to vote in the General Election. I expected this month’s post to be summarising the result was and what it might mean for businesses. But after having a hung parliament result, the UK was also hit by several horrific events, which rightly so, somewhat overshadowed who is going to run the country. With the recent terror attacks in the UK and the Grenfell disaster, the last 6 weeks has been a very emotional time. I don’t know anyone directly involved and I can’t even begin to imagine how they must feel. My heart goes out to anyone personally impacted by these dreadful events. The Queens speech on the 21st June, addressed some of these issues and outlined what her government's priorities will be for the coming year. She spoke about a full investigation into Grenfell and also increased counter terrorism activity. In response to the European Union, the Queen also spoke about getting the best possible deal and a successful Brexit delivery. Other priorities will be strengthening the economy, creation of jobs, increased funding for the NHS and fair funding for schools. She also spoke about tackling the gender pay gap and increasing the National Living Wage. Overall it was a positive speech, but it didn’t give any specifics. Following on from it, it was announced that Theresa May and the Conservative party have reached an agreement with the Democratic Unionist Party, which will see the DUP support Theresa May's minority government. The deal was reached several weeks after the election, and will see the 10 DUP MPs back the Tories in key Commons votes, but there will be no formal coalition. As we don’t yet know what the impact will be for businesses, I'm sure we will all be keeping a close eye on proceedings. The latest UK ‘JobsOutlook’ survey by the Recruitment & Employment Confederation (REC) shows that employer confidence in the economy has stabilised following the EU referendum a year ago. The survey of 607 employers shows that confidence is up in their own company’s hiring and investment decisions; employers are more optimistic. “One year on from the EU referendum, it is encouraging to see the labour market continue to perform well despite the political and economic turbulence. Although confidence in the economy had fallen, businesses have held their nerve and delivered record levels of employment in the UK and this should be applauded." June was set to be a difficult month with so much going on politically, but with the terror attacks and Grenfell disaster, it has proved to be one of the UK’s most turbulent months in recent years. As businesses locally carry on with their day to day activities, we are always here to support as much as we can with anything relating to permanent and temporary recruitment. And I'm sure we are hoping for a much calmer July for us all.